Wow, I’ve only been blogging since early June but I’ve been nominated for the Blog on Fire Award by the wonderful blog The Goodie Plate. For those of you who haven’t visited The Goodie Plate, you should – it’s full of drool-inducing photos & recipes, many of which are desserts (which is exactly why I visit the site) but with a healthy spin (unlike the stuff I make!). They’re not all food blogs but they are all awesome. Some make me laugh, some make me think, and others are just full of delicious food. Take a look, show them some love. 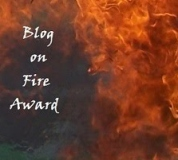 Thank you for passing on the Blog on Fire award! It’s greatly appreciated! It’s so nice to meet another person just like myself who’s gotta get baked! Thank you for the shout out!!! 🙂 It means a lot! I love visiting your blog as well. . keep sharing your stories and recipes!